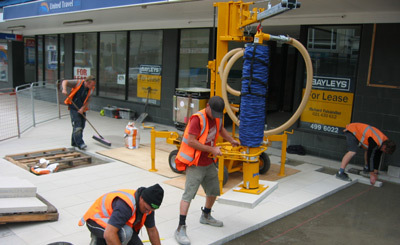 Horizon International is an agent for Probst Handling equipment in New Zealand. Probst make a huge number of specialised equipment designed for ease of handling and quality of laying. 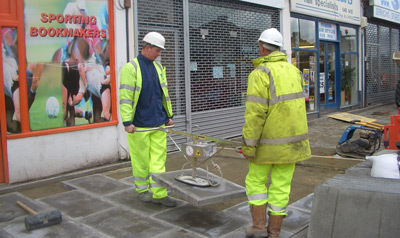 For the easy, exact and economical laying of slabs up to 200kg. Suitable for concrete slabs, natural stones, slabs with exposed aggregates, large pavers, petrol station pavers, environmental pavers, gutters & much more. Extremely easy & light laying as the lifting and setting down are done by a vacuum hose lifter. Exact positioning of the slabs by means of a smooth-running pillar swing crane with a very low dead weight. Slabs which have already been laid, can easily be lifted again. Quiet vacuum generation using an electrical motor, or alternatively a fuel engine. Can easily lay up to 300 square metres a day.